Recently, I’ve been glad to see Mondays come. I work weekends right now, kind of a lot, and quiet Monday mornings to catch up on work and cleaning are kind of a huge relief. ESPECIALLY when you consider that we spent 2 hours and more than that in hundreds of dollars at the emergency vet last night. OH YES, my friends. Happy Super Bowl. I’ll tell you the whole ordeal tomorrow, but rest assured that 1. no parents were negligent and 2. no doggies did anything wrong, our older dude just got sick. He’s fine now, and WAIT FOR IT. Puppies coming down off morphine are HIGH-larious. We actually had a paranoid labrador in our house last night. More on that tomorrow, though. The THING about these working weekends is that we travel, and hence eat like crap. Now, I’m not a guilty eater. I enjoy food, and I’m not especially thin, but I’m not overweight and right now that works for me. What I do notice, though, is that I simply feel better when I eat foods that are better than, say, buffalo-flavored anything two meals in a row. OH YEAH, that happened. No guilt. BUT, I want to start the week off really well to get through the funk of being up with a dog all night and being sluggish from the salt/fat/chemicals. 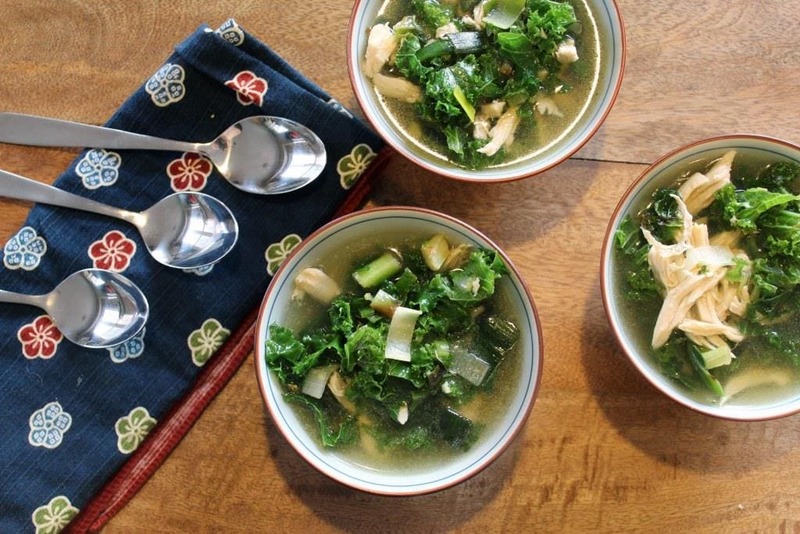 Hence, chicken soup with no added carbs, roasted garlic, lemon, kale, and leeks. I MEAN COME ON. Delicious and very healthy for this tired body. Let’s make it! 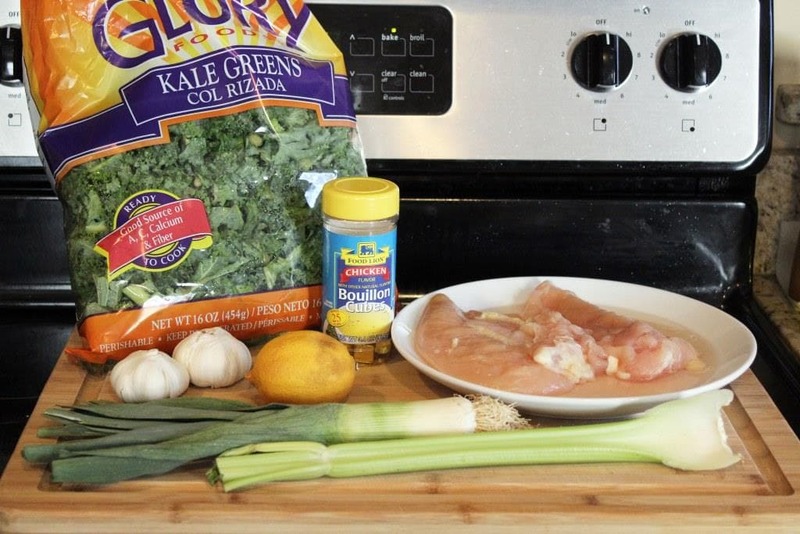 You need some chicken, white or dark meat, a stalk of celery, a large leek, some kale (the precut stuff was on sale, but about 4 ounces of kale leaves with stems removed and chopped is fine), garlic, lemon, and chicken stock or bouillon. Either is fine, try not to obsess too much. First, we’ll roast the garlic. Wrap the whole heads in foil, and stick ’em in the oven at 425F for 45 minutes. The house will smell good. While the garlic is working, we’ll poach the chicken and use the poaching liquids to make the soup. You could also use 1/2 rotisserie chicken with skin removed shredded. How easy! Put the chicken in a large pot and cover with water by 1/2 inch. Bring to a boil then reduce the heat and simmer for 10-15 minutes until the chicken is cooked through. Remove the chicken to a plate, and pour the cooking liquid into a bowl to the side. Add the bouillon cube to the reserved cooking liquid. 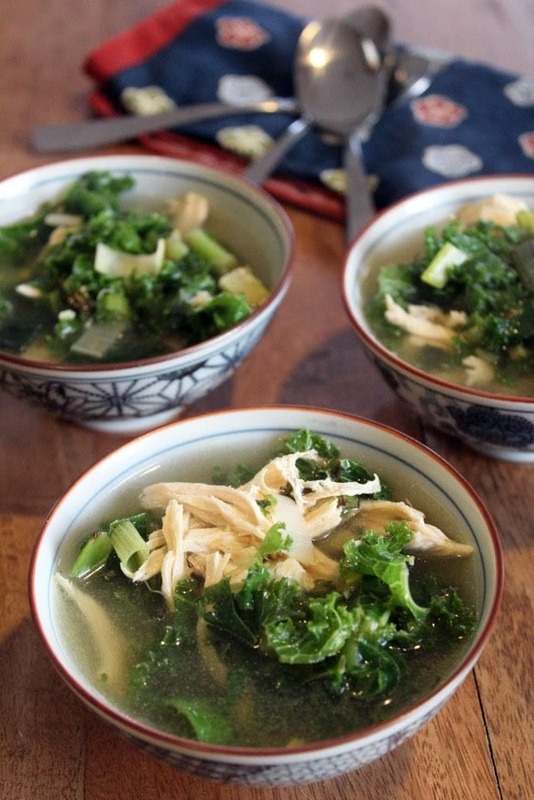 If using stock instead of bouillon, poach the chicken directly in the stock. While the chicken is cooking and cooling, let’s get to work on the leeks. 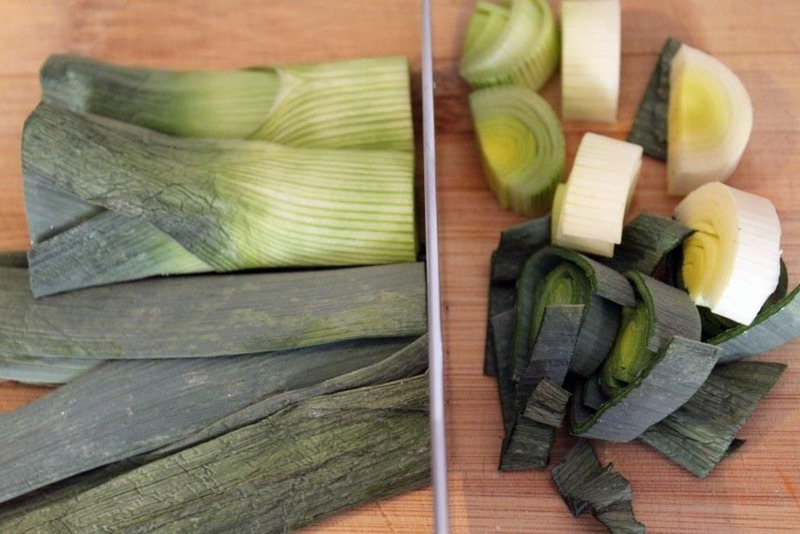 Leeks have dirt inside their layers, so we cut first, then wash. It’s weird. cut the root end of the leek, cut it in half all the way down the middle, then cut the halves into little half moon slices. Place the leeks in a bowl filled with water. 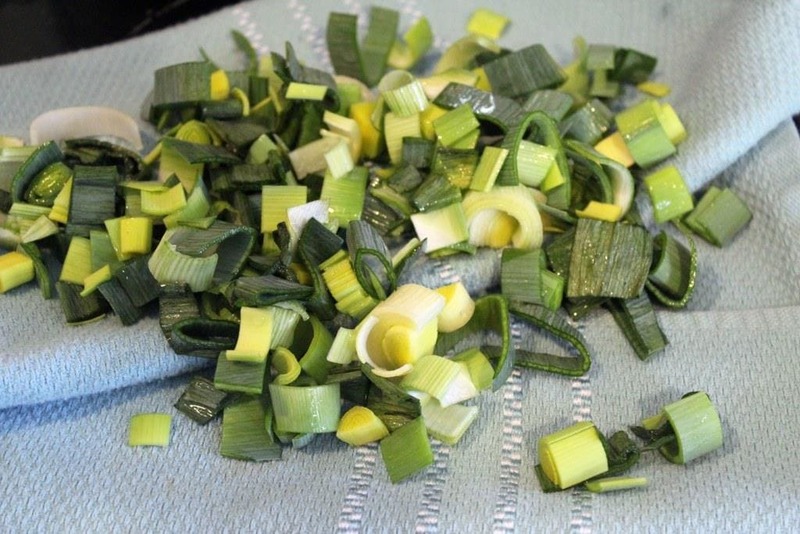 Swish them around like a washing machine, then let the leeks sit for 5 minutes or so. The dirt and grime will all fall to the bottom of the water. Gently fish out the leeks (so you don’t disturb the dirt), and move them to a kitchen towel to drain. Clean leeks! Nice. 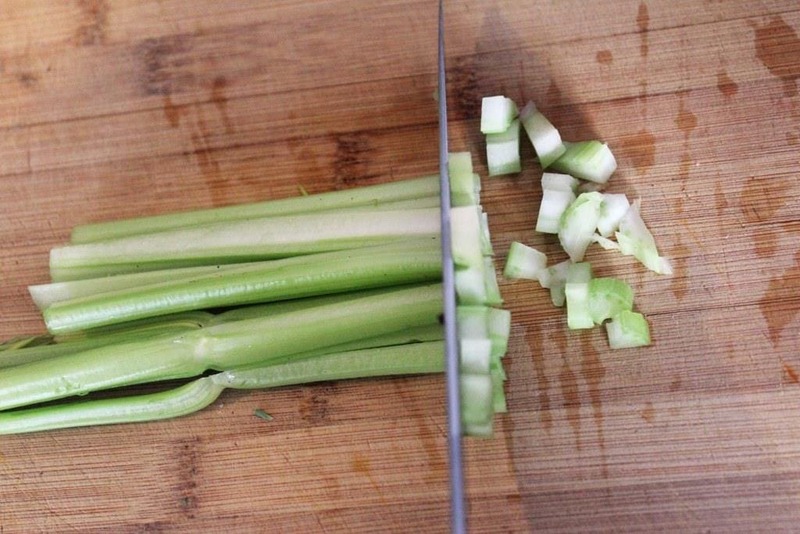 Cut the celery into small strips, then cut the strips into bits. Now, we should have cooked cooled chicken, reserved stock/bouillon water, and roasting or roasted garlic. 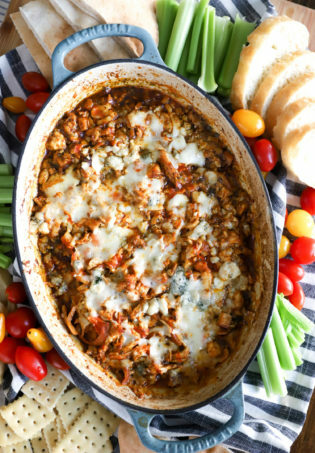 Shred the chicken into bite-sized pieces with your fingers or two forks. Let’s build the soup! 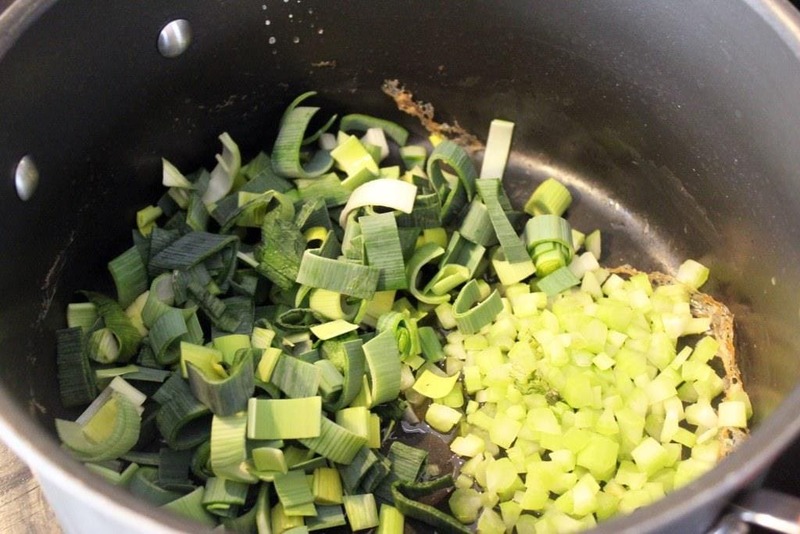 To the same pot you used for the chicken, add a little olive oil with the celery and leeks over medium-high heat. Stir the veggies for 3 minutes or so until they sizzle and start to cook just a bit. Then toss in the kale. 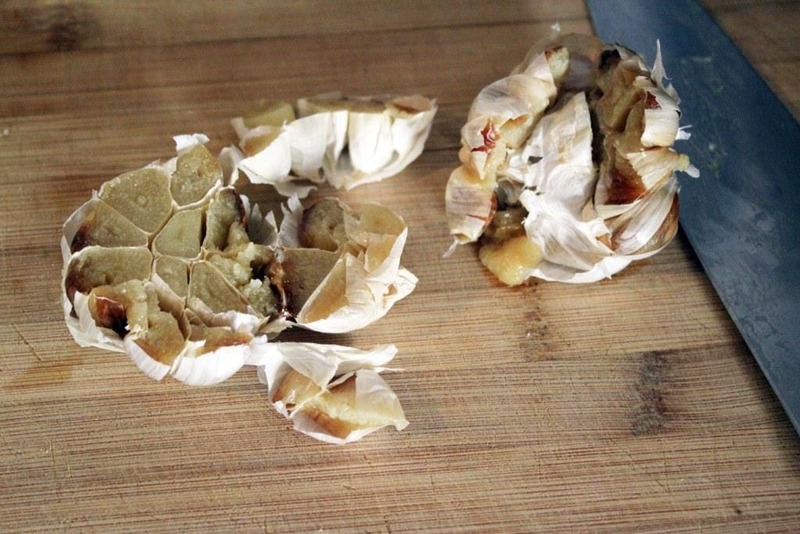 Cut the roasted garlic bulbs in half. And squish all the cloves into the soup pot! Nom. 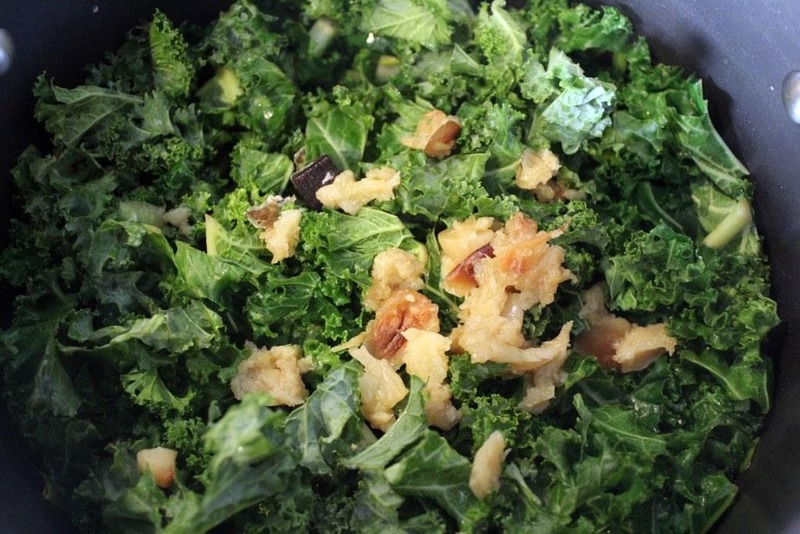 Add a sprinkle of salt over the kale, and stir all the veggies together with the garlic for 2 minutes. 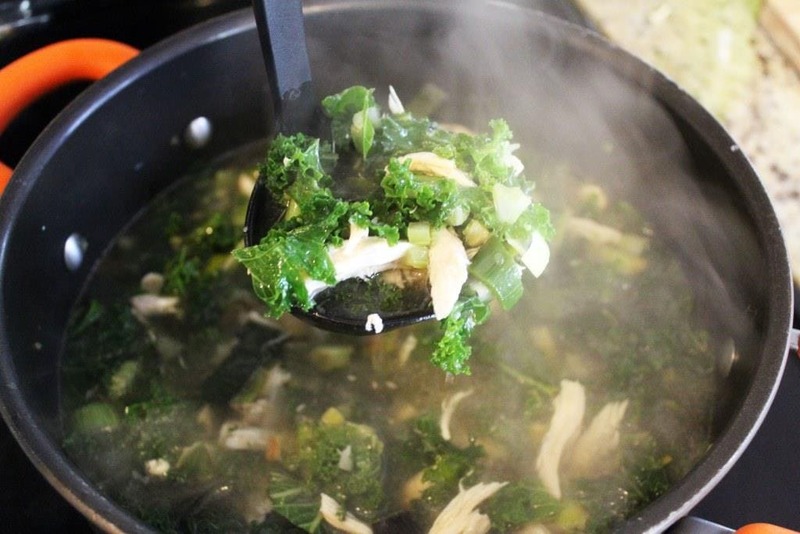 When the kale starts to wilt just slightly, add the chicken cooking liquids back to the pot with the chicken. Then squeeze in the lemon juice! 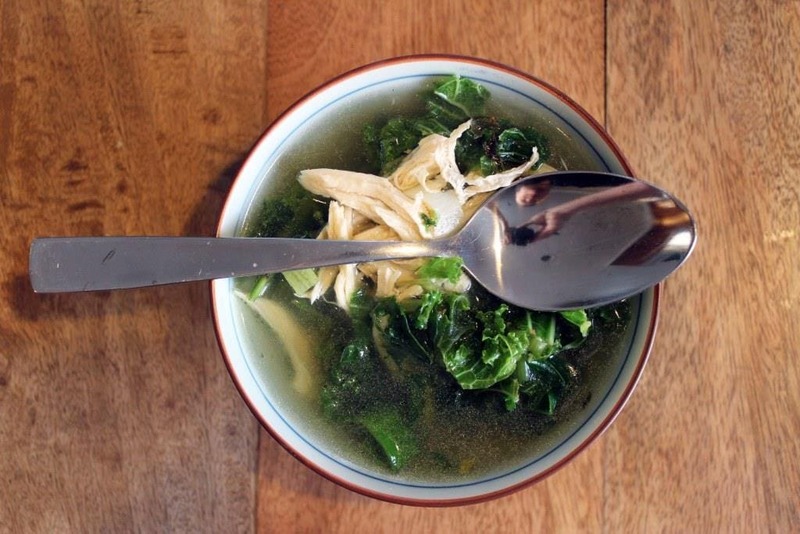 Stir the soup together and taste – add more chicken stock or water if you need extra liquid, or salt and pepper if you think it needs it. Let the soup simmer for 10 minutes to combine all the flavors, and we’re done! The kale doesn’t get overly cooked or brown, the chicken is tender, and the roasted garlic is soooooo roasty. You just don’t even know. Enjoy this, friends. It’s perfect for a winter day but light enough for a Monday and fast enough for the busiest nights, PROMISE. If you think of it, roast the garlic and poach/shred the chicken in advance for an even faster cooking time! Wrap the garlic in foil, then roast at 425F for 45 minutes until the garlic is very tender. Remove from the oven, and let cool. Meanwhile, poach the chicken. 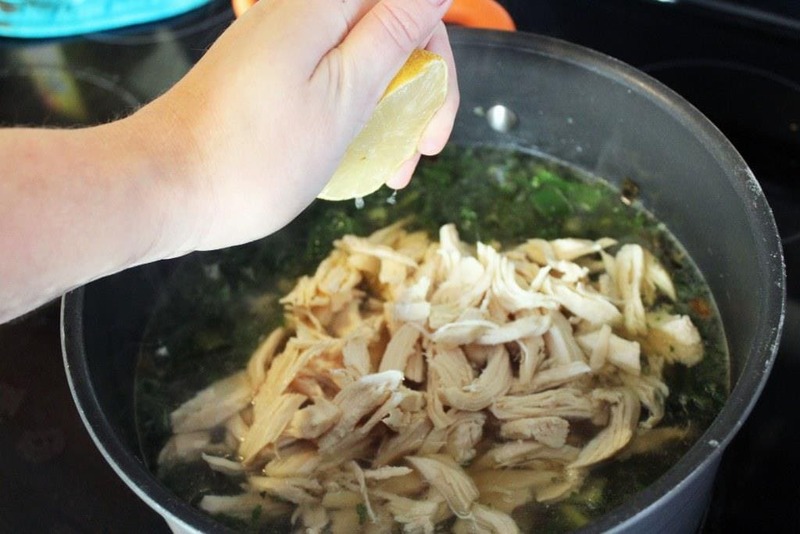 In a soup pot, cover the chicken by 1/2 inch with the stock or water with the bouillon. Bring to a boil, then reduce to a simmer and cook through gently, 20 minutes for bone-in chicken and 10-15 for boneless. 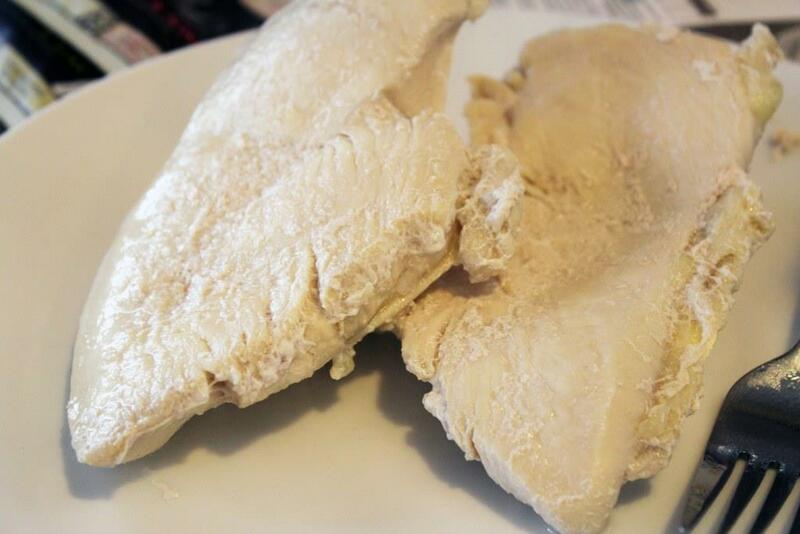 Remove to a plate when cooked and let cool; shred the chicken when you can handle it. 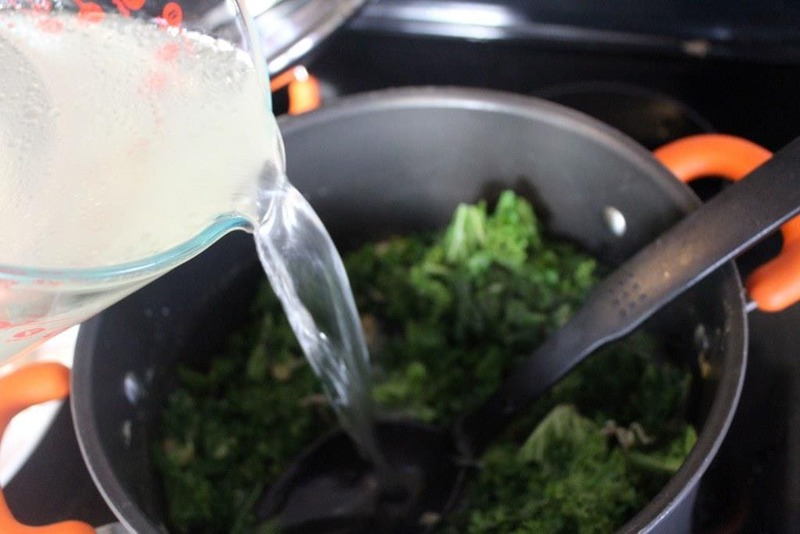 Pour the cooking liquid into a bowl. 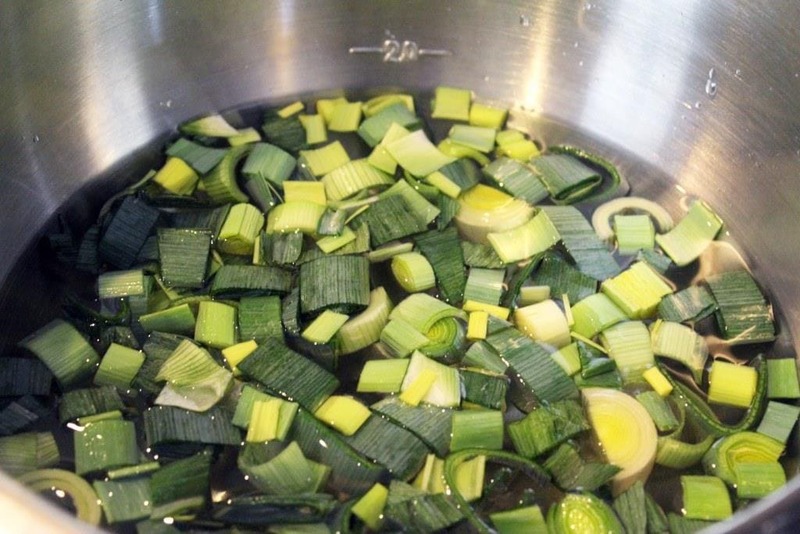 Return the soup pot to medium-high heat with a drizzle of oil, the leeks, and celery. 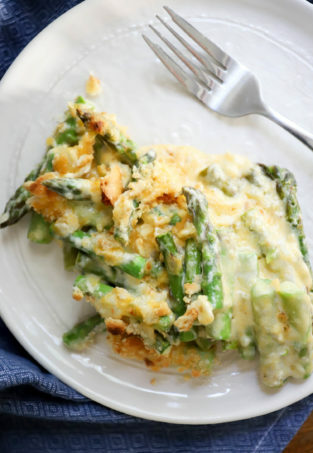 Cook for 3 minutes, stirring, until the veggies soften slightly. 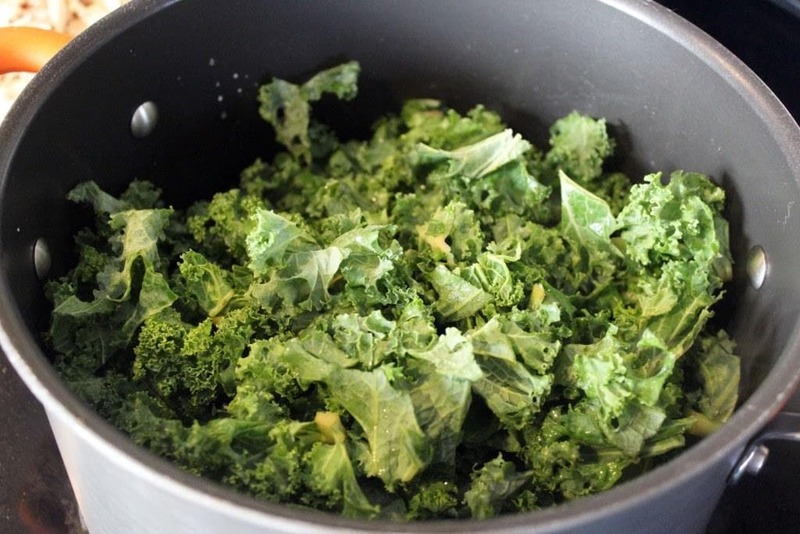 Add the kale to the pot. Cut the garlic heads in half crosswise and squish the roasted cloves into the pot with a sprinkle of salt. 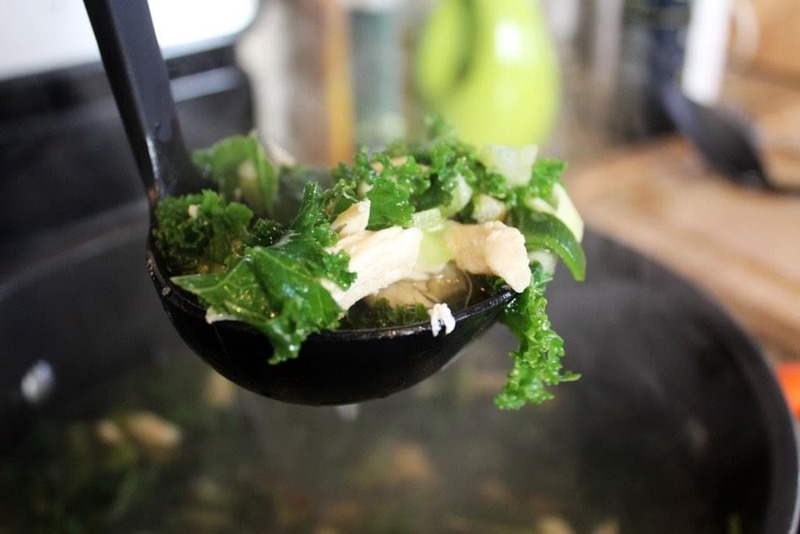 Stir the veggies all together for 2-4 minutes until the kale wilts just slightly, then add the chicken, cooking liquids, and lemon juice to the pot. Stir the soup, and taste. 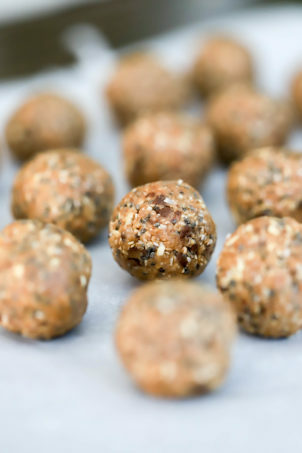 Add more water or stock for a brothier soup, and salt and pepper to your taste. 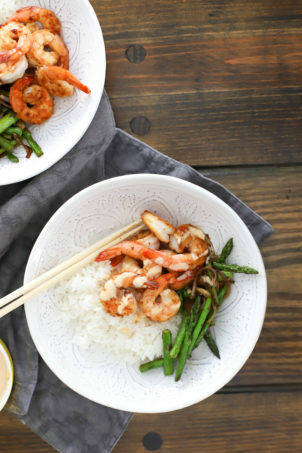 Let simmer for 10 minutes, then serve! 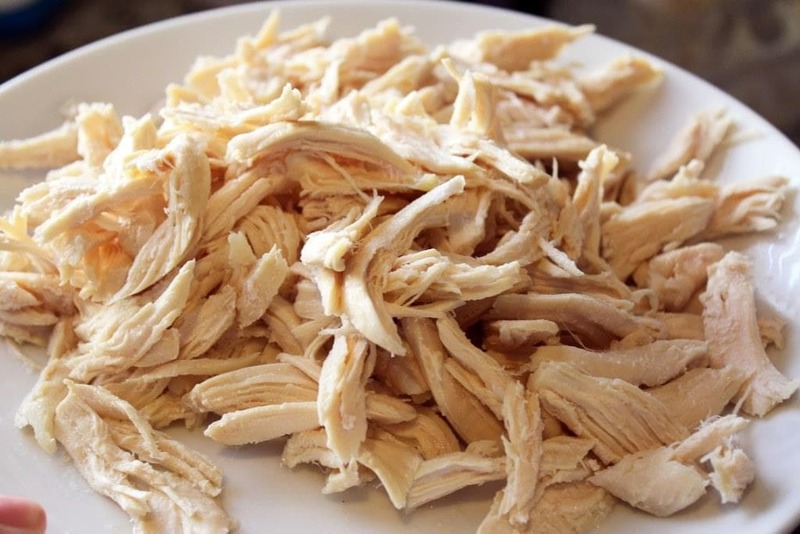 Sub 1/2 rotisserie chicken with skin removed, shredded, to save time on the chicken! Roast the garlic in advance for even faster cook time.